Białowieza Forest is the kind of place you imagine from the Grimm fairy tales. Huge firs, oaks and ashes tower over you, woodpeckers and other birds call all around you and the guides who work there know the intimate history, and names, of many individual trees. For anyone, it is a magical place – and, as a forest ecologist, visiting it was a dream come true. However, the features that make it so unique may be under threat thanks to new plans for large-scale logging. Straddling the border between Poland and Belarus, Białowieza is the last remainder of the vast primeval forest that once covered most of Europe. It is a hotbed of biodiversity, home to nearly 20,000 plant and animal species including wolves, lynx and the largest remaining population of European bison. Rare birds, including several woodpecker species, provide a glimpse of the bird life that used to exist in European forests before humans transformed the continent. The forest is home to around 800 bison. Unfortunately, on the Polish side of the border, only one third of Białowieza Forest is protected. Outside of this area as much as 35% has been earmarked for felling and the fear is that this will result in an increasingly isolated small “island” of protected forest surrounded by fragmented and poorer quality woodland, which has already been shown to support lower bird populations than the protected park area. Felling around Białowieza has been controlled in the past; quotas were set in 2012 to limit how much wood could be removed. However by 2015, 90% of that quota had already been logged – and the new proposals will triple the permitted volume of logging. The proposal for further logging is controversial. Poland’s state forest department, Lasy Panstwowe, views the felling as necessary to combat outbreaks of spruce bark beetle, the larvae of which burrow under the bark of living spruce trees to lay its eggs. The developing larvae feed on inner woody layers and can eventually kill the tree. Spruce bark beetles were here…and it didn’t end well for the tree. However, both local scientists and NGOs, such as Greenpeace Polska, argue that removing damaged trees will cause more harm than good and that further logging is driven by economic rather than management interests. Professor Tomasz Wesołowski, who has studied Białowieza’s birds for more than 30 years, told me it would be a disaster, as logging and replanting would completely change the quality of the forest habitat and threaten its UNESCO heritage site status. There is even a suggestion that this violates Poland’s environmental commitments under the EU’s Natura 2000 program. The newly proposed logging areas cover 20% of the old-growth forest, as well as areas overgrown by endangered bog woodland habitat. Mass logging would dramatically alter the character of both the areas in question and the surrounding habitat – even more than the bark beetles. In fact, across the world this form of “salvage logging” to recover economic value from damaged forests often causes more damage to ecosystems than the initial natural disturbance. 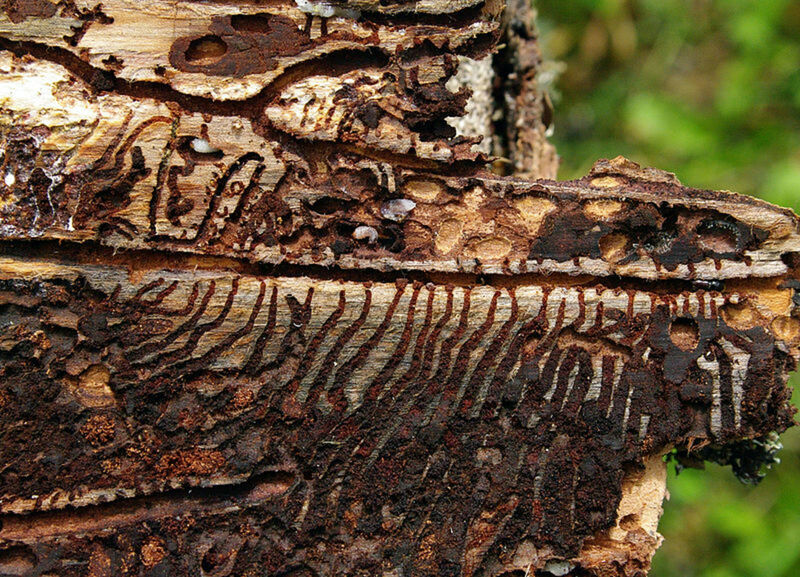 After a bark beetle invasion hit Sumava National Park, that stretches across the border between Bavaria and the Czech Republic, evidence showed that salvage logging delayed forest recovery. The proposed increased logging in Białowieza includes removing quantities of dead wood, yet this dead wood plays an important role in the functioning of a healthy forest. 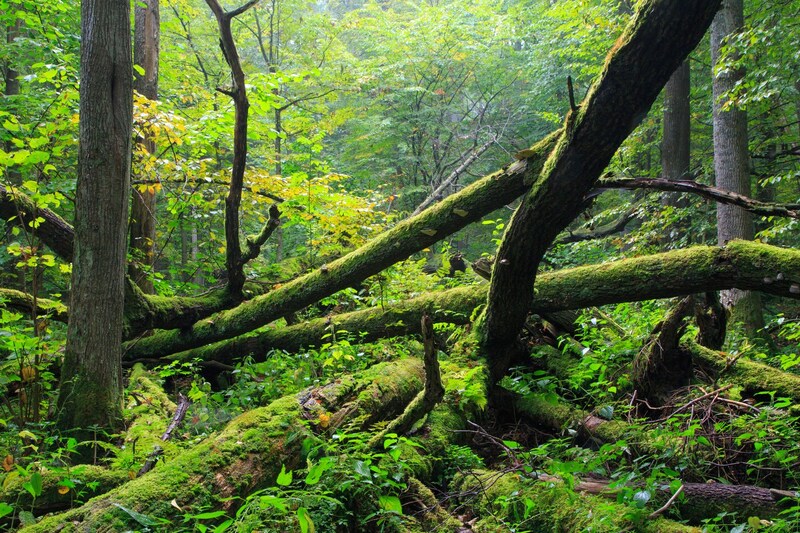 Forests are often built from the bottom up, with dead wood as the foundation. While aesthetically they may not be that pleasing for us, dead trees are a vital habitat for saproxylic insects which feed on dead and decaying matter. Białowieza supports large populations of endangered saproxylic beetles and invertebrates which rely on dead wood and, in turn, these provide food for birds, small rodents such as shrews and voles, and bats including the rare barbastelle. In turn these animals are eaten by larger predators such as owls, wolves and lynx. The forest food web starts here. Dead and dying spruce stumps are almost exclusively used by some woodpecker species as nests and also act as great hosts for lichens and mosses, some of which are facing extinction in Europe. If the dead wood is removed, the entire forest ecosystem will suffer. Logging is not the only solution to the spruce bark beetle problem. Pheromone traps, for instance, effectively attract large numbers of beetles while outbreaks in the UK are controlled by unleashing a specific predator beetle, Rhizophagus grandis, that targets the spruce beetle. Due to its widespread use in commercial forestry, R. grandis is relatively cheap and readily available, and Forestry Commission research showed it was more effective at controlling outbreaks than salvage logging. In any case, a beetle infestation might be disastrous for individual trees but it won’t necessarily harm the forest itself. Like many ecosystems, Białowieza is vulnerable to climate change. As species such as Norway spruce are weakened by changing climatic conditions, the bark beetle is able to take hold. This is an invaluable part of the forest regeneration process, allowing deciduous trees that are better able to cope with changing climatic conditions to grow in the gaps left by dying spruces. In the long run it may be better for Białowieza Forest to let nature, and regeneration, take its course. The link below is to an article reporting on the problem with spiders and snakes on Guam.